The first sights of Yerevan do not suggest a city planned or built with a great deal of care and consideration. Zvartnots Airport, named after a ruined cathedral nearby, is a circus of concrete and aluminium surrounds a derelict central control tower. From this building you can already infer two very important things about Armenian modern architecture: an appeal to the glorious past, combined with a flamboyant futurism and a tendency to neglect. The road from the airport, meanwhile, gives a completely false sense of what sort of a city (central) Yerevan is. Dusty, small houses and dozens of neon-lit improvised kiosks and gas stations, and behind them, the nondescript fortress of what was the largest US embassy in the world outside of Baghdad when it was built in 2005. It’s not here, as it might be in the Baltic, to keep an eye on Russia, but because of Armenia’s position on the borders of Iran and Turkey, and a short distance from Iraq and Syria. And then, quite abruptly, you’re in an absolutely exemplary, planned, and impeccably “European” city. 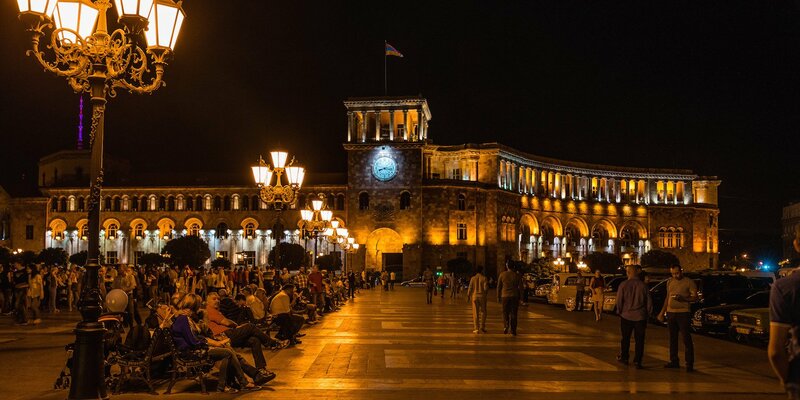 Yerevan offers the spectacle of an ancient city (it was founded as Erebuni in the eighth century BC — some fortress ruins are preserved in the suburbs) where almost everything you can see was built between the 1920s and 1980s. It also offers the spectacle of a Soviet city where the notion of a “national form” was deployed consistently from the very beginning. Some explanation of this can be found in the horrific events that immediately preceded its incorporation into the Soviet Union. In the 19th century, Armenia was divided between the Ottoman and Russian Empires; the assumption that Christian Armenians would sympathise with the Russians was the logic of the first genocide of the 20th century, the extermination in 1915 of over a million western Armenians by the Young Turk government. Refugees streamed into Yerevan — a small city which became briefly the capital of an fragile independent republic in the aftermath of 1917. The Bolsheviks, who had a large proportion of Armenian activists, eventually retook eastern Armenia in 1920, with the Red Army marching in without firing a shot. Within a couple of years, the Bolshevik government of Soviet Armenia commissioned Alexander Tamanyan — an exile from revolutionary Petersburg — to design a town plan for its capital. The resulting plan is an icon of the city. You can find it on logos, as a relief in cafes, as an object of branding. It is not a 20th-century plan in any way: with its green Ringstrasse, and its radial spokes terminating in a vast opera house, it was more like the Hapsburg Empire reborn in the Soviet Caucasus. And as with a Hapsburg city, the result is exceptionally pleasant, logical and easy to understand. There is a rhetorical aspect to it, too. 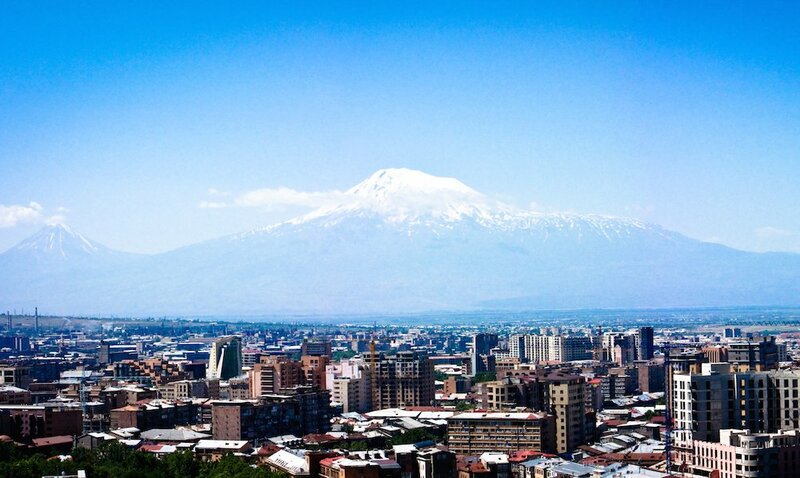 Many of the main streets lead up to slopes, from where you can get jaw-dropping views of Mount Ararat, the double-peaked mountain where Noah’s Ark ended up, its snowy top roaring up out of the clouds. Mount Ararat is, however, just over the border, in Turkey. 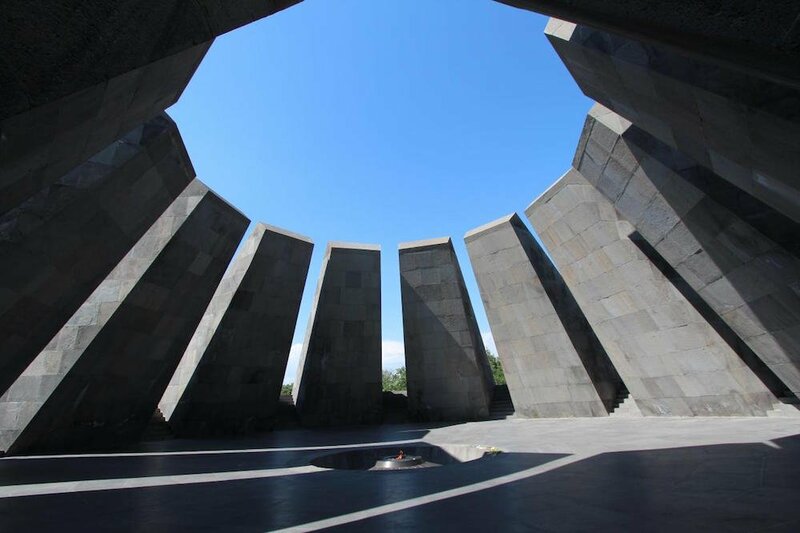 The plan seems to have been deliberately executed to create a longing for the lost western parts of Armenia, and for the hundreds of thousands who were massacred there. It’s town planning as either memorial or irredentism, depending on what side of Ararat you’re on. There are two main squares in Tamanyan’s plan: Lenin (now Republic) Square and Opera Square, the former largely laid out in the 20s, the latter in the 30s. Lenin Square is a elongated circus, flanked by opulent classical buildings built between the 20s and 70s by Tamanyan and his students. The House of Government, the main Hotel and the National Museum are defined by the gorgeous stonework typical of the city, in pink tufa, yellow sandstone and grey basalt. Every building has colonnades, archways and abundant ornamentation, based on an at-least-partly imaginary idea of ancient Armenian architecture; friezes of warriors, workers and peasants represent the “Soviet” contribution. 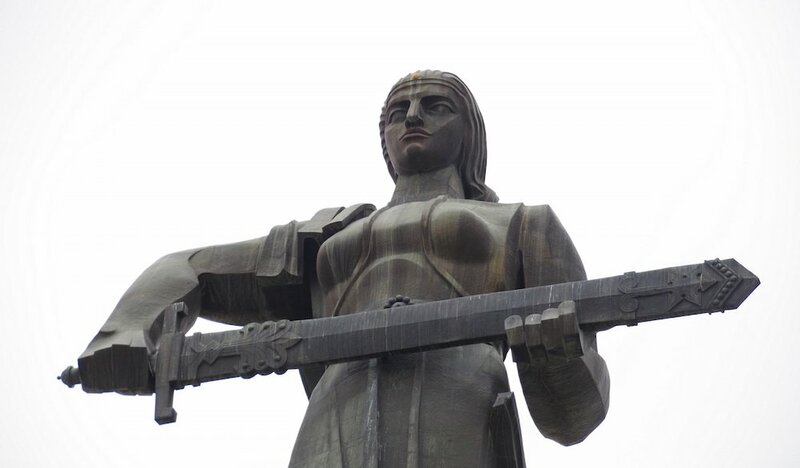 This rhetoric — “national in form, socialist in content”, as the Stalinist cliché went — is common to Socialist Realist architecture all over the former Union, but there are two major differences in the Armenian version. The first is the richness of the craftsmanship. In Ukraine, Belarus or Kazakhstan, this would be tiles or stucco on top of concrete or breezeblock, but here you have beautifully cut ashlar, warm in colour, which ages handsomely, however little it is renovated. The second is the fact that much of this actually precedes the broader Soviet shift in the early 1930s to a pompous neoclassicism. As much as he was one of the last great beaux-arts architect-planners, Alexander Tamanyan was perhaps one of the first Stalinist architects, hitting early on that mix of nationalist imagery, monumental symmetry and heroic populism. 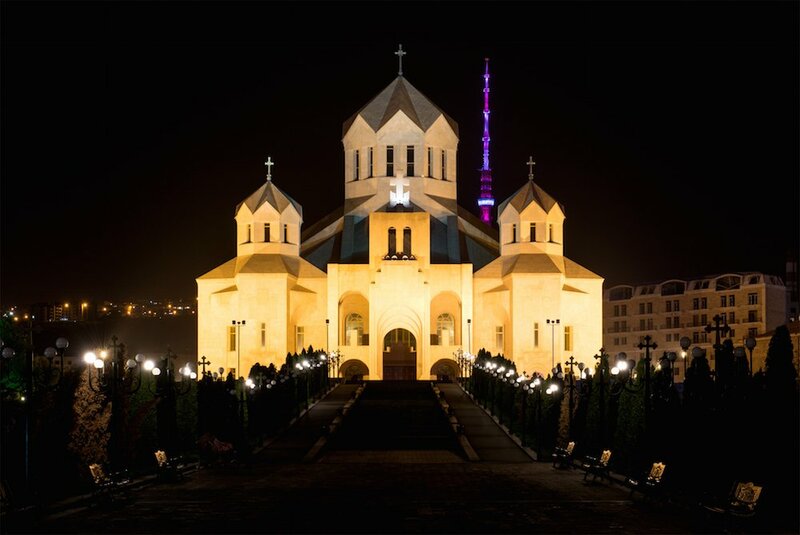 On the hills around Yerevan are the major monuments of the planned neoclassical city: the Ararat Cognac Factory, designed by Rafael Israelyan in 1938, in a lurid, almost orange stone; the Mother Armenia statue, replacing one of Stalin in the 1960s; and the Matenadaran, a museum and archive dedicated to illuminated manuscripts from Armenian churches and monasteries. 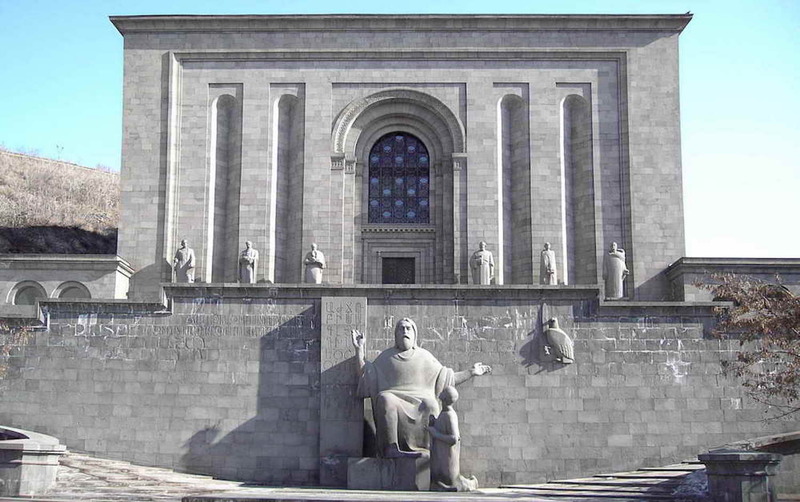 The Matenadaran was designed by Mark Grigoryan in 1945, and completed 12 years later, by which time it was out of fashion, surely one of the most superfluous and excessive of Stalinist schemes. Regardless, it is an unforgettable building. Hewn from grey-white basalt, and rising from a monumental plinth at the top of the hill, it is heavy and square in its form, given a sense of height and dominance through carved niches and archways; carved out of the same basalt, as if emerging out of the building, are hieratic, Mesopotamian-style statues of great Armenian scholars. Attempts to simulate the ancient are of course ubiquitous in eclectic and historicist architecture, but this has the kind of despotic power and seamless craftsmanship that could convince you it really has been here forever. These ceremonial spaces of Stalinist Yerevan give the place the air of some sort of Biblical epic, a Cecil B De Mille approach to quasi-ancient scenography. Unusually for a big city on the USSR’s periphery, it is hard to imagine what a successful bourgeois government would have done differently to this. It’s also notable that, as in a bourgeois Mediterranean or Levantine city of the same date (but unlike an average Soviet city of the same), all the interest, wealth and grandeur is in the centre, with “informal settlements” and unrenovated prefab slabs and towers on the outskirts. 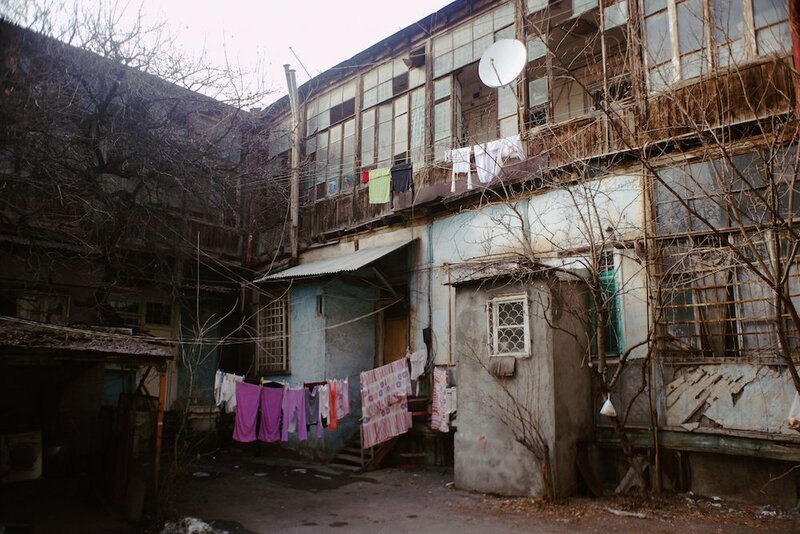 However, unlike in Tbilisi, informality has not quite taken over the centre. Tamanyan’s city, and the ancient-Stalinist architectural style he pioneered, is largely uninterrupted by plastic and plasterboard. At least, that’s the impression you could form by just walking around the streets themselves. Pass inside the courtyards and the situation is completely different. Here, informality and planning failure are as inescapable and unstoppable as they are in the Georgian capital. Everything from balconies to blocks of flats to office towers to hipster hotels has been inserted into these public spaces. A tangle of services and power lines stretch above the asphalt. It’s clear that what has happened isn’t actually a continuity of planning culture at all, just the creation of a city plan so strong that 30 years of neglect couldn’t seriously affect it. The traces of the genuinely ancient city are also to be found behind the main streets, often appearing like afterthoughts and surprises in Tamanyan’s presumably deliberate downplaying of the “real” ancient Armenian city. There’s the tiny, red and yellow 13th-century Kataloghike Church, discovered inside an 18th-century basilica demolished in the 1930s, and itself now dominated by the recent St Anna Church. Another historic building in a courtyard is Yerevan Mosque, built in the 1760s; until as recently as the late 19th century, the city had a Muslim majority. 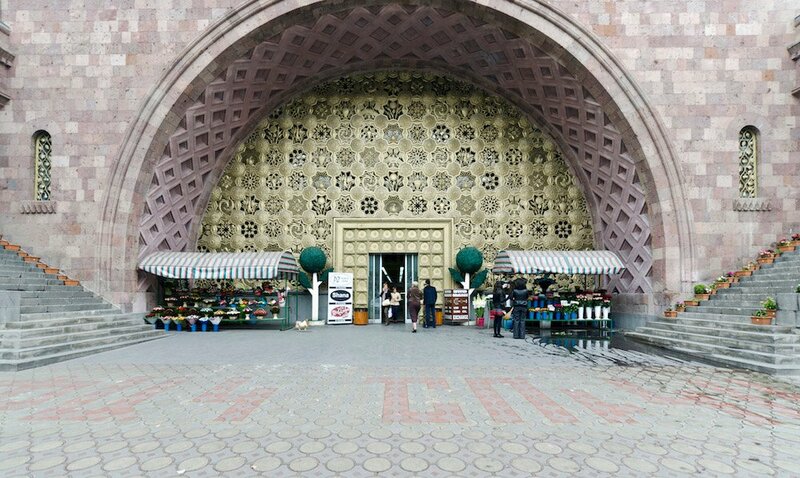 The Mosque was the Museum of the City of Yerevan under the Soviets, but has since the 1990s been a mosque again, thanks in part to a restoration paid for by the southern neighbour, Iran. The Mosque, reached through a decorated gate, with a lovely, quiet green square beyond, is in the Persian style found across Central Asia, rather than the Ottoman style of the Balkans and western Asia. 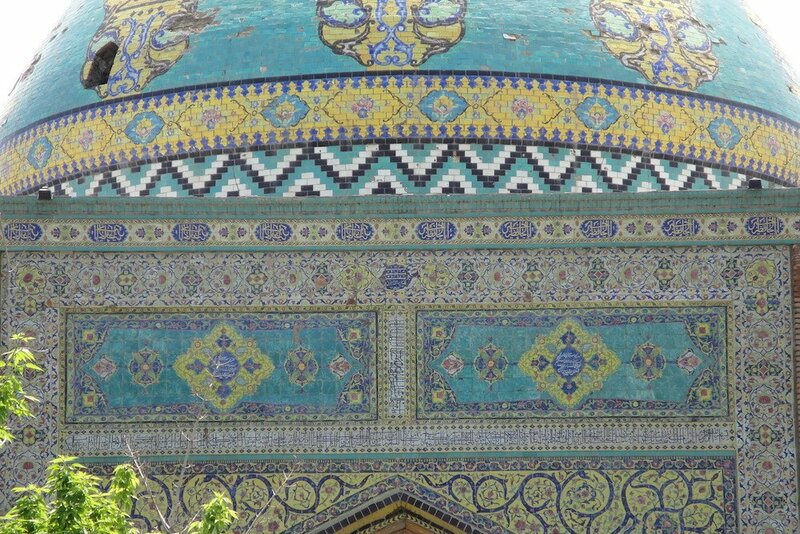 The brick construction and geometric tiles of the gateway-like facade are topped by a gorgeous and highly mammarial blue dome. With a simulated ancient city of such grandeur and intensity, any kind of modern architecture has found it hard to make much of an appeal. 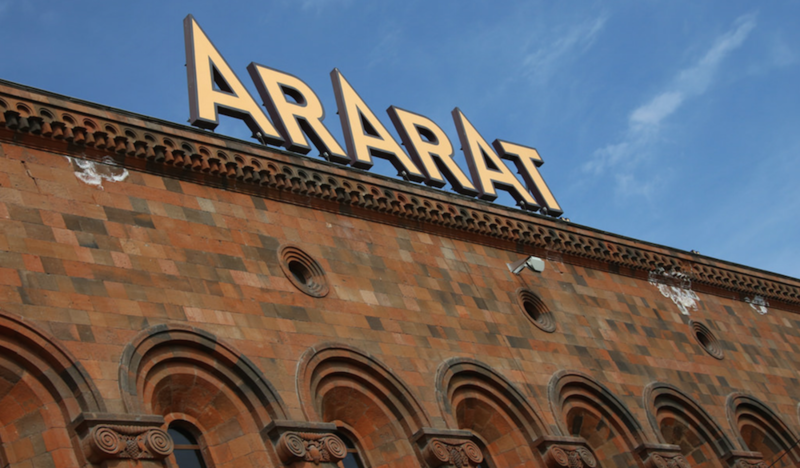 The architect and historian Karen Balyan talks about the “two deaths of Armenian modernism”: the first happened when the avant-garde, “proletarian” architects of the 20s lost their positions in the Stalinist 1930s. Tellingly, despite the city being built up largely in the 20s and 30s, there are few interwar modernist buildings in Yerevan, and none rivalling the originality and prominence of those in Moscow, Kharkiv, Yekaterinburg or even nearby Baku; the most interesting is probably the NKVD headquarters, laconic modernism with emphasised circular stairwells, clad in heavy, rusticated tufa. Between 1956 and the mid-70s, there was in fact a blossoming of modernism, with some major new buildings were placed into the green space of Tamanyan’s Ringstrasse — the Komitas Chamber Theatre designed by Stepan Kyurkchyan in 1968, the same architect’s Yeritasardakan Metro Station, opened in 1981, and the House of Chess Players, designed by Zhanna Mesheryakova in 1967. 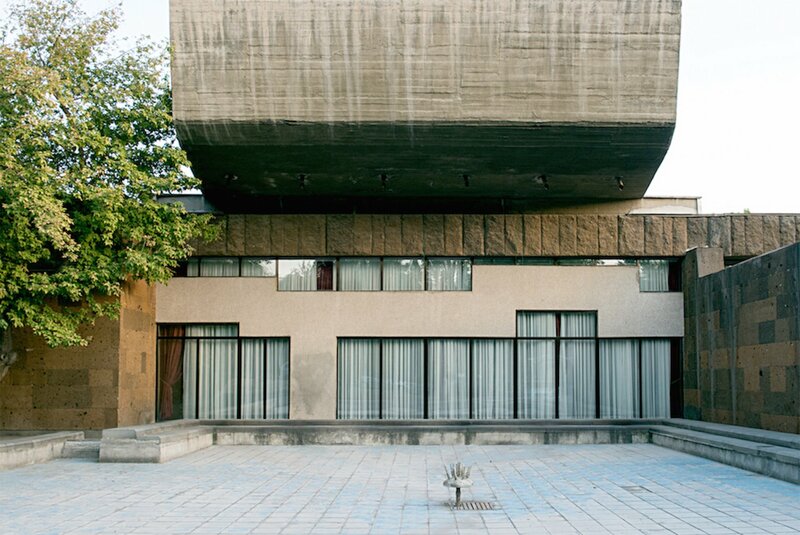 Along with other scattered modernist complexes — such as the powerful but small-scale Brutalist Puppet Theatre, with its shutter-marked concrete, designed by Margarita Hayrapetyan in 1968 —these show the scope that Armenian architects were capable of in that era. There is still much obvious inspiration from historic architecture, only in a much more subtle way: the carved chessmen on the otherwise unornamented stone flanks of the House of Chess, or the concrete hall of the Komitas Theatre, which has the lofty, contemplative proportions of an Armenian chapel. 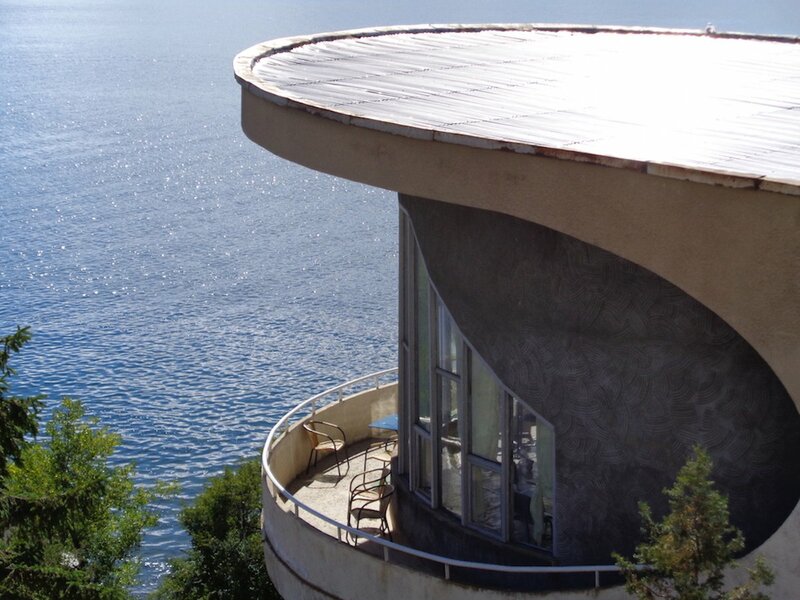 Modernist buildings that have occupied island sites have fared less well. Opposite the disused Rossiya Cinema (1968-75) is an image of where the Armenian national tradition in architecture ended up. Begun as the Soviet Union collapsed and finished in 1997 to the designs of Stepan Kurkchyan, the Gregory the Illuminator Cathedral is a repro ancient church, the Cathedral Tamanyan’s socialist city never had, modernised slightly through a cubistic approach to form, but otherwise “church-like” enough to satisfy the brief. 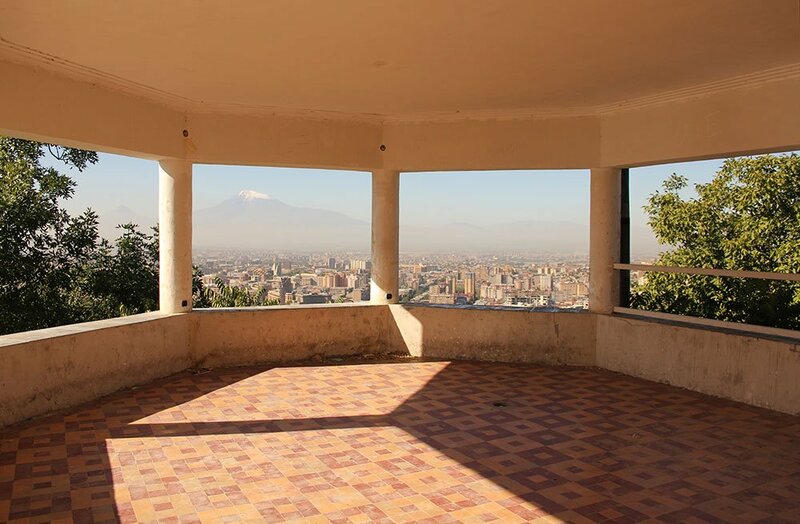 How architecture in Yerevan went from the confident Brutalism of the Puppet Theatre or the Rossiya Cinema to this sort of traditionalist bet-hedging is best described via the triumphant return of the national style in the 1970s — Balyan’s “second death” of Armenian modernism. Most of the buildings that resulted from this in the first instance are wonderful, marking a triumphant return to fantasy, scenography, ornament and patriotic tale-telling. The building that, for Balyan, finished off Armenian modernism for the second time was the National Museum, designed in the 70s on Lenin/Republic Square. 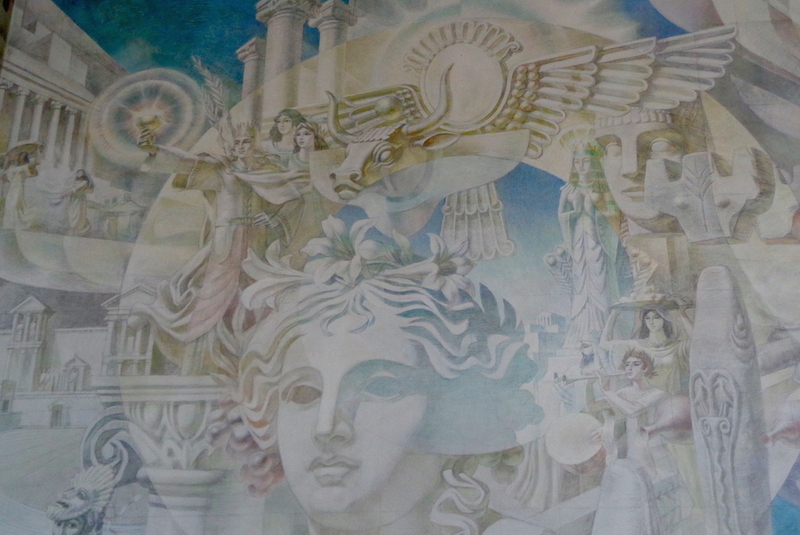 A smaller-scale example of this fantastical style can be seen in the Khnko Aper Children’s Library, designed in 1980 by Levon Ghulumyan and Rouzan Alaverdyan, whose interior is a fairytale world of ancient-socialist Yerevan, with a mind-bending mural in the reading room depicting Armenian history from the 8th century BC to the 1980s: from pagan temples and Sphinxes to atomic power and tower blocks. Using similar imagery, although to a much more extreme end, is the Cascade, begun in 1975 and left unfinished at the USSR’s collapse, by Sargis Gurzadyan, Aslan Mkhitaryan and Jim Torosyan. This travertine-clad stairway, a sort of steroidal, Biblical Odessa steps, is one of the emblems of the city. Fountains and sculptures at each level aim to represent different eras of Armenian history, intended to culminate in Communism (left unfinished). This part of it is bare concrete with rusting reinforcement sticking out, the symbolism of which escapes no one. Then there’s the Metro. 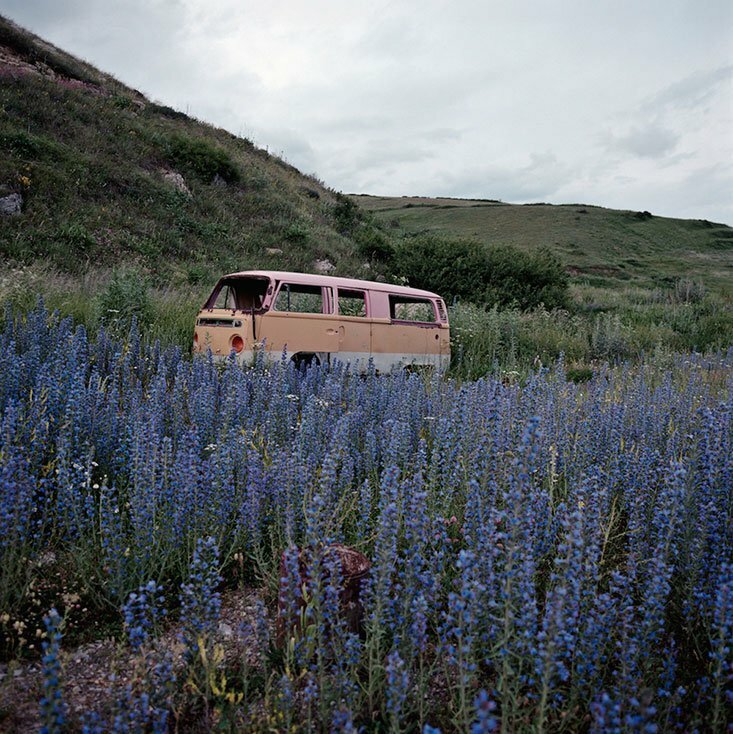 The fact that this compact city has a Metro at all comes, according to Ruben Arevshatyan, from the creative lobbying of Moscow by the Armenian Communist bureaucracy — insisting that despite the city’s small size, they had so much congestion that they needed a Metro, Yerevan’s authorities arranged traffic jams to impress the visiting Ministry of Transport. The Metro’s nomenclature shows an ecumenical, or schizophrenic attitude to Soviet history, so different from the absolutes insisted on elsewhere: the network was renamed in 1999 after Karen Demirchyan, the chair of the Armenian Communist Party when it was built, while one of its major stations was renamed in 1992 after Garegin Ndzheh, a nationalist leader and sometime Nazi collaborator. Also renamed after Karen Demirchyan — who was killed, along with much of the then-government, in a shooting at the Armenian Parliament in 1999 — is an enormous sports and concert centre, up on Tsitsernakaberd hill, overlooking the city and Mount Ararat. This is the less famous of the two monuments on the hill: the other is much more important. 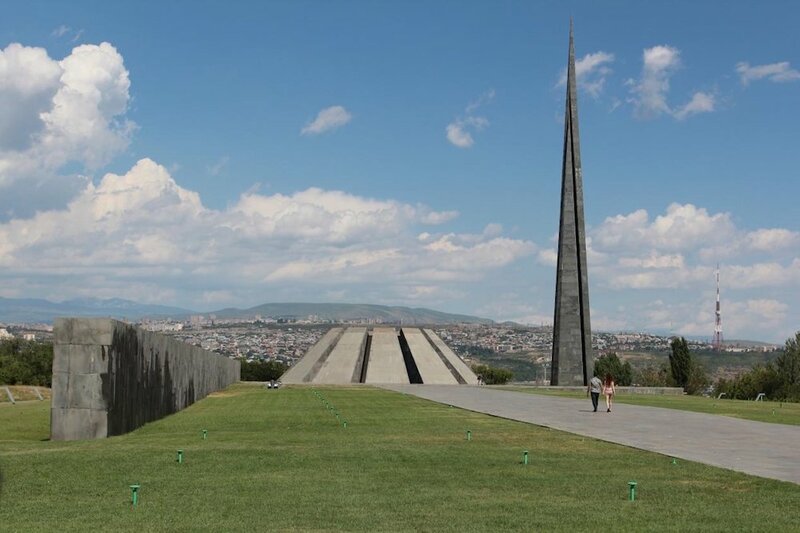 After demonstrations calling for a memorial to the dead of 1915, Moscow acquiesced — despite the obvious antagonism it caused in relations with Turkey, which then as now denies the genocide — a competition was held, and the memorial complex was opened in 1967.